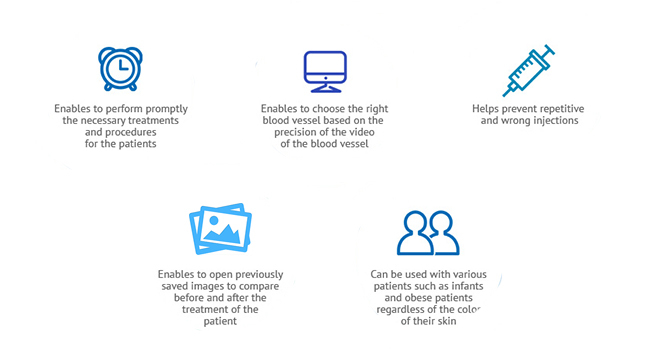 Our SIFVEIN-3.1 can be widely used not only for infants, elderly, and obese patients but also for patients with different skin tones. It detect subcutaneous superficial by pantended infrared light technology, displaying vivid vein map on the surface of skin. It helps Medical staff find vein’s location and reduce needle stick attempt. Our Head-mounted 3D Vein Finder is a revolutionary tool for helping to locate veins for medical procedures. Useful for a variety of patients in many settings and serves to supplement existing venipuncture techniques. Our Vein locator uses an infrared camera to highlight blood and then projects the image onto the skin, making easier for health care provides to do necessary needle sticks. Suitable for locate the veins on dorsal hand, arm, elbow, foot and head. Head-mounted 3D Vein Finder is suitable for any department that needs venipuncture and for any skin color and any part of the patient who needs venipuncture. Truly achieve “a needle”, thus reducing the pain of multiple puncture patients and the risk of infection. The 3D vein finder instrument is composed of DLP optical digital processing system, near-infrared camera and infrared LED, etc. It uses specific near-infrared light to illuminate the body surface. In the optical window of the human body, the infrared light can penetrate the skin and a certain thickness of adipose tissue, get the image through the double camera, and display the image on the skin after the digital image processing. The blood vessel image seen by the medical staff and the actual vessel image is 1: 1 ratio, without any deviation, the blood vessel is clearly discernible, and the medical staff can easily find the blood vessel. No color, no light, no part, no medical environment will affect the operation. The main application field of 3D headset vein imaging instrument is the tool of vein puncture to find blood vessel. The purpose of this paper is to transform the image information such as the position and direction of vein which is not obvious or difficult to locate into the visible image of the naked eye and display it clearly. *the blood vessels of the patients were clearly visible through a 3D head-mounted venous imaging apparatus. *small size, light weight and easy to carry. *powerful, easy to use and unique 3D imaging technology. *apply to any skin colour, any crowd, any part of the superficial vein puncture.